이 고택이 위치하는 산운마을은 북쪽의 금성산과 남쪽의 창이들 들판 사이에 자리잡고 있으며, 조선 명종 때 영천이씨가 들어와서 같은 성씨마을로 번성하였다. 마을에는 운곡당과 소우당을 비롯하여 10여 채의 전통가옥이 남아 있으며, 운곡당은 소우당을 지은 이가발의 형인 운곡(雲谷) 이의발(李義發)이 지은 것이다. 소우당은 조선 후기 의성지방 양반의 집으로 살림채와 별당에 해당하는 안사랑채의 두 영역으로 이루어져 있다. 살림채는 대문채, 안채, 사랑채, 중문채로 되어 있는데, ‘−’자형 대문채를 들어서면 ‘ㄱ’자형 안채와 ‘ㄴ’자형 사랑채, 중문채가 합쳐서 전체적으로 튼 ‘ㅁ’자형으로 되어 있다. 사랑채는 소우素宇 이가발李家發이 19세기 초에 지었다고 전하며, 안채는 1880년대에 고쳐 지었다고 전한다. 별당으로 불리는 안사랑채는 앞쪽에 연못과 숲을 만들어 여유롭고 운치있는 곳으로 꾸며 놓았다. 소우당의 특징은 안채와 사랑채로 이루어진 중심영역의 서쪽에 별도의 토담을 둘러 넓은 공간을 확보하고 거기에 별서*정원을 조성했다는 점이다. 또한 사랑채 동쪽 끝에 있는 중문을 통해 안채로 출입하게 하는 방법은 조선 후기 양반집의 특징을 보여주고 있다. *별서 - 오늘날의 별장과 같은 뜻으로 휴양을 위하여 집 말고 경치 좋은 터전을 골라 따로 마련한 집이다. 조선시대에는 별서(別墅)·별저(別邸)·별업(別業)·별제(別第) 등으로 불렀다. This village is located on the plain and a small hill between the northern Geumseongsan Mountain and the southern Changideul Plain. Since it has a scenic view resembling clouds hanging below Sujeong Valley, this village was called "Sanunri." 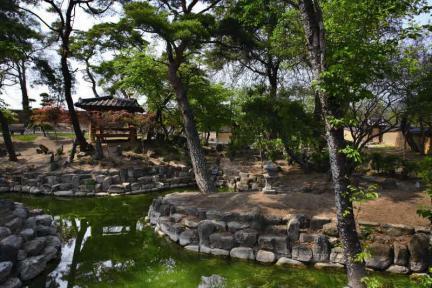 The exact history of the formation of this village is not known; according to a legend, however, Yeongcheon Yi’s Clan settled here first during the reign of King Myeongjong of the Joseon Dynasty. 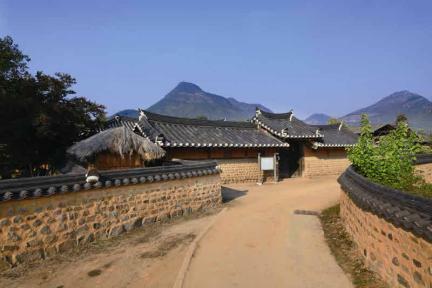 There are some 10 traditional houses such as Ungokdang House and Soudang House in this village. 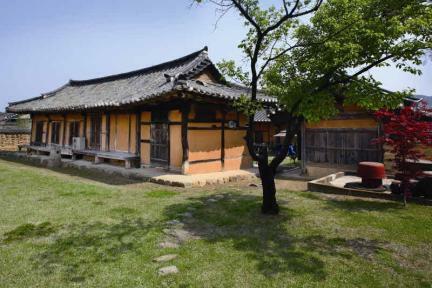 Legend has it that Soudang House was built by Yi Ga-bal, the 6th great-grandfather of the present owner, in the early 19th century, with the anchae (women’s quarters) repaired in the 1880s. 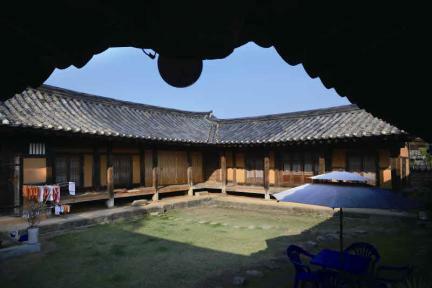 The “ㄱ”-shaped anchae and “ㄴ”-shaped sarangchae (men’s quarters) form an overall “□”-shaped layout as they encircle the courtyard. 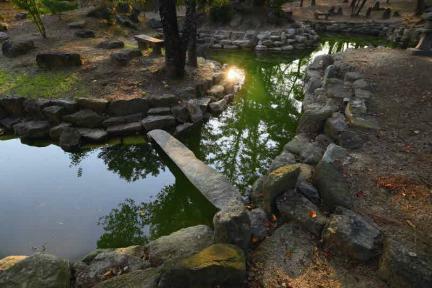 The “ㅡ” shaped munganchae (gate quarters) lies south. A separate fence west of the anchae forms a space. A detached building called villa is situated in the space. Around the building is a beautiful garden with a pond and lots of trees. 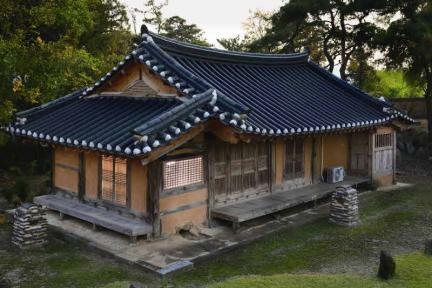 The anchae and sarangchae have a separate gate. This high-class house was built in a simple style. In particular, the villa built within the fence shows the elegance and artistic refinement of that time. ※ Viewing of the cultural property above is usually available anytime but may be limited depending on the owner’s personal circumstances.